The perfect base to discover the real multi-cultural London. Surrounded by street markets and lively music venues, the exciting atmosphere will make your London stay a memorable one. Nearby Goldsmiths University was home to the 1990's Britpop movement and Young British Artists movement, with famous alumni including artist Damien Hirst and Blur/Gorillaz frontman Damon Albarn. This nearby establishment continues to make the area a creative and vibrant destination. Our bright, friendly and recently-refurbished hostel is housed above The Royal Standard pub - a funky bar with a unique twist, as here you will find an eclectic mix of live music, visitors from all over the world, traditional Jamaican, african and english food. Our fun-loving staff ensure you will have a good time and promise to keep the hostel clean, comfortable and safe at all times. Journeys London Greenwich West has an atmosphere bursting with character, for an authentic and unique London experience you will never forget. Join us on FaceBook - Search for 'Journeys London Greenwich West' to find photos, special offers and to meet other guests! We have a fridge and a microwave accessible during limited hours. The hostel has also now a cafe shop, accessible to all our customers; the menu has a large selection of food and drinks with very reasonable prices for those who are staying with us. Communal kitchen facilities are available for use by all guests between 9am and midnight. Come out of the station turn right and then left onto the main road. Carry on walking (5 minutes) until you reach Tanners Hill which will be on the right hand side and we are located 150 metres on the right hand side. 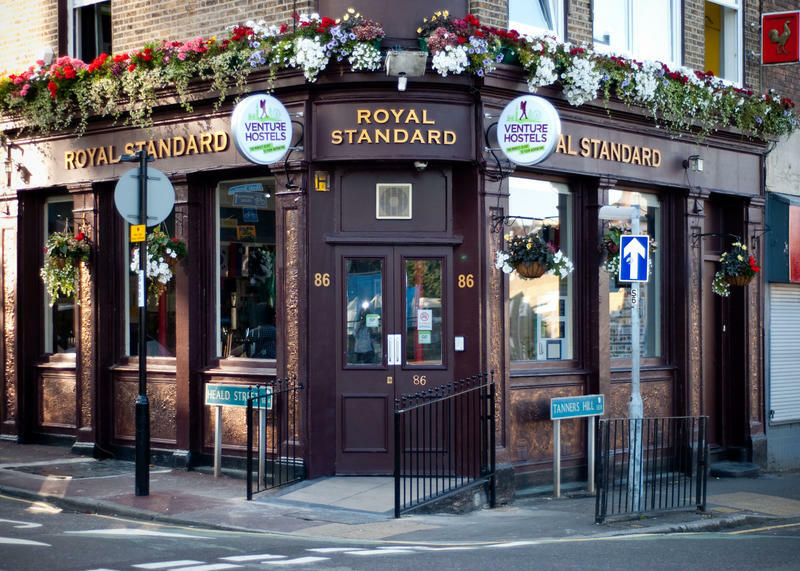 It is a large GREEN building on the corner, situated inside the Royal Standard Bar. Gatwick: From Gatwick airport catch the National Rail service into London Bridge station. From here take the train to New Cross tation (4 minutes) and then we are only a 5 minute walk. Luton: Coming from Luton makes your trip very easy. If you simply take the express train into Kings Cross station. From here move onto the Northern Line(BLACK) 4 stops southbound to LONDON BRIDGE. From here take the overground train to New Cross (4 minutes). We are only a 5 minute walk from the station. Stansted: From Stansted take the express train into Liverpool Street Station. From here, take the Underground one (1) stop to Moorgate and change onto the Northern Line (Black) going towards London Bridge. From here take the overground train to New Cross (4 minutes). We are only a 5 minute walk from the station. Heathrow: Catch the Piccadilly Line and change at Kings Cross, from here catch the Northern Line to LONDON BRIDGE. take a train to New Cross (4 minutes) and we are only a 5 minute walk. By Bus: From the west-end (Piccadilly Circus, Leicester Square, Trafalgar Square, Westminster) simply catch bus 453 towards Deptford alighting at Deptford Bridge. If you are coming from Victoria, jump on bus 436 towards Deptford/Lewisham.